Using native flowers for your area is always your best bet when landscaping. Rather than use pretty but useless, hybridized annual flowers in my garden, I have chosen to use flowers that provide lots and lots of nectar for hummingbirds. Below is a list of some favorite annual and perennial hummingbird flowers. They may not all be native but none are invasive in our area. These flowers will not only help attract hummingbirds, but will also welcome other birds, bees, and butterflies. Agastache rupestris (Sunset Hyssop) - Bushy perennial with orange-pink, tubular flowers. Think of it as a low-maintenance hummingbird feeder. Most Agastaches will work in our area, some as annuals, some as perennials and most are drought tolerant. ***Asclepias tuberosa (Butterfly Weed) - Drought-tolerant perennial with bright orange flowers for attracting hummingbirds and butterflies. ***Aquilegia (Columbine) - Spring-blooming perennial in a wide range of colors. Native Aquilegia formosa has red flowers that are best for attracting hummingbirds. Buddleja (Butterfly Bush) - A butterfly and hummingbird attractor alike, but some consider them to be invasive. Candy Corn Vine (Manettia luteorubra) - A profusion of yellow tipped, red-orange cigar-shaped flowers are borne throughout the summer on this dainty tropical twining vine. Very easy to grow and small enough to grow in a hanging basket or 6' fence. Can be brought indoors easily to overwinter. 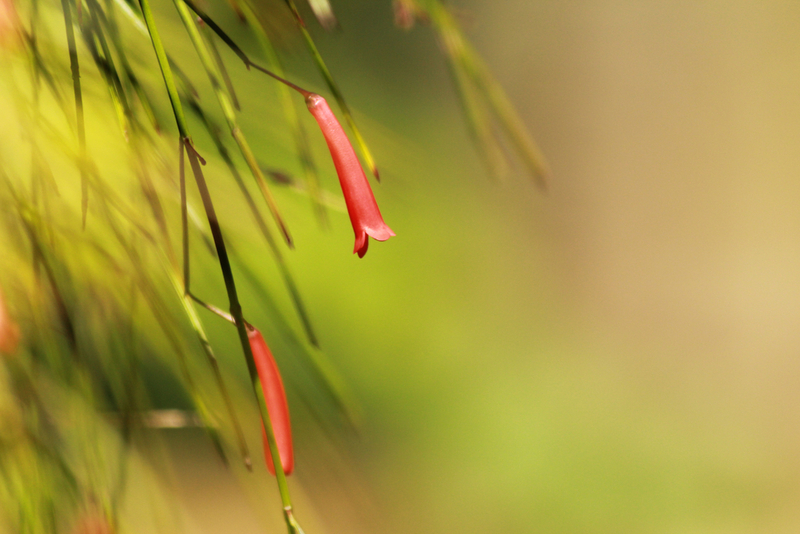 Sometimes called Brazilian Firecracker Vine. 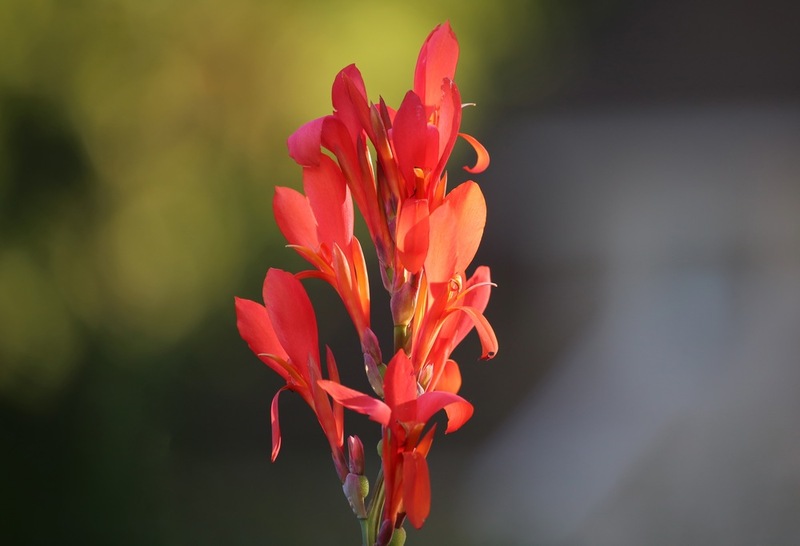 Canna x generalis (Robert Kemp Heirloom) - True red upright blooms and lush greenery that is a giant variety that reaches approximately 6 feet tall (although maximum height depends a lot on growing conditions). These need to be dug up in fall and replanted in Spring. ***Campsis radicans (Trumpet vine) - This hardy vine attracts hummingbirds, bees, butterflies and orioles but be careful to keep it in check, it spreads everywhere and can wreak havoc on foundations and septic systems if placed too close to structures. 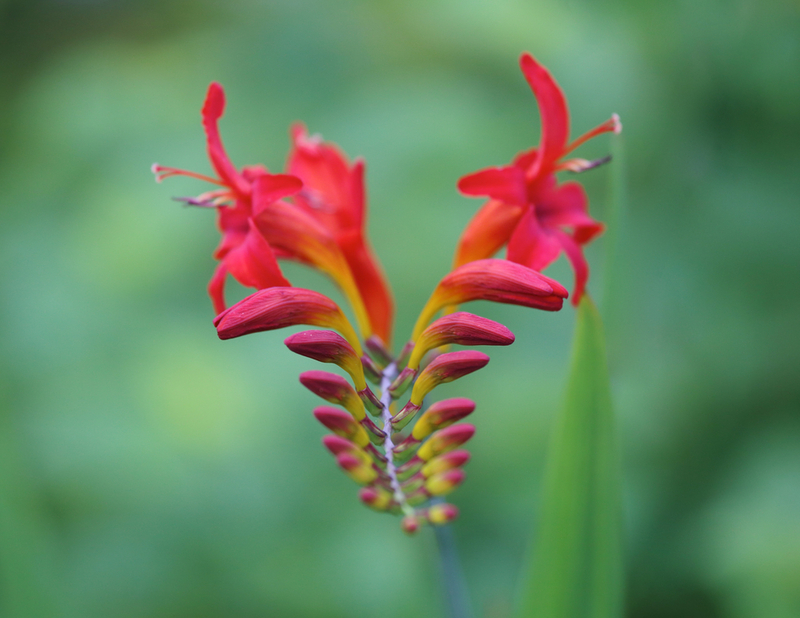 Crocosmia lucifer - This East African bulb produces a huge bounty of intense red flowers and comes back year after year. Cupheas - Annual, tropical plants that are well visited by hummingbirds. Bat faced cuphea is wonderful for use in window boxes and is easy to care for, David Verity is a must have as well. Dicliptera suberecta (Hummingbird Plant) - A hummingbird's dream come true… If attracting hummingbirds is one of your goals, this plant is a must for your garden. May be a perennial in our zone. ***Eupatorium maculatum (Joe-Pye Weed) - A native perennial that blooms in the fall. The mauve flowers attract hummingbirds and butterflies. Fuchsia - Most Fuchsias will attract hummingbirds, Gartenmeister Bondstedt (F. triphllya) and Marinka are two I recommend. ***Goldenrod - (Solidago arguta - Atlantic Goldenrod) One of the last flowers of the season. This native perennial provides nectar for hummingbirds, butterflies and beneficial insects. Hesperis matronalis - Violet flowers in late spring. Also attracts butterflies. Hibiscus - Hummingbirds spot these huge flowers from across the yard, and they swoop in to investigate. They may not provide much nectar but they'll certainly attract them. ***Impatiens capensis (Jewelweed) - Also called "Touch-me-nots", nicknamed because of it's exploding seed pods. This plant needs moisture to grow and often grows alongside Poison Ivy. The sap of jewelweed is even used to relieve itching from Poison Ivy rashes. The pretty bell shaped flowers it produces is a very important plant during the Ruby-Throated hummingbird's fall migration south. This is a plant that often grows along roadsides, mowing or mulching with wood chips destroys it. Impatiens balsamina (Balsam) - Self-sowing annual with bright colors. Ipomoea (Morning Glory) - Hummingbirds are more attracted to the red varieties like Ipomoea luteola, but all colors are good. Morning Glory since it does reseed is invasive. 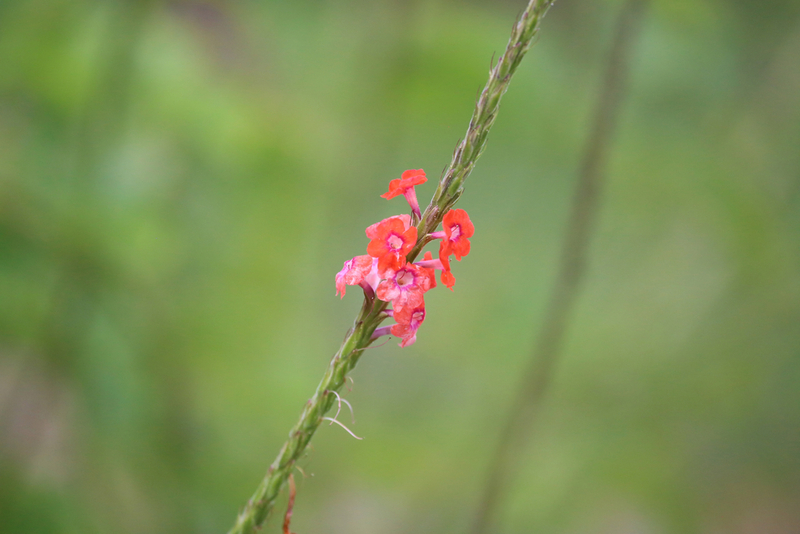 Ipomopsis rubra (Standing Cypress) - A Texas native and is highly attractive to hummingbirds. ***Liatris (Blazing Star) - Tall spikes of purple flowers for hummingbirds and butterflies. Native perennial. ***Lobelia cardinalis - A shade loving native perennial Hummingbirds love. ***Lonicera sempervirens - Major Wheeler Honeysuckle is a favorite, flowers early spring, summer and fall and is not invasive. Beware Asian honeysuckle which is very invasive, it's the one that smells pretty but don't use it. Lupine 'Morello Cherry' - Blooms in late spring before most other flowers get started. Lychnis chalcedonica (Maltese Cross) - The vivid red flowers are a beacon to hummingbirds. Mirabilis jalapa (Four O'Clock) - The flowers close up in the heat of the afternoon, so watch for hummingbirds in the early morning or evening. ***Monarda citriodora (Bee Balm) - A wonderful perennial that attracts hummingbirds and butterflies and is must have in any native garden. The variety Jacob Cline seems to preferred by hummingbirds. ***Penstemon - Drought-tolerant, native perennials for hummingbirds. Phlox paniculata David - Showy, fragrant perennial that attracts hummingbirds and butterflies. Russelia equisetiformis (Firecracker plant) - A favorite of hummingbirds; this annual is a must-have for tropical butterfly gardens. Great for tall border, trained to trellis, or spilling over walls and hanging baskets. Stachytarpheta mutabilis (Porterweed) - A tropical plant that is extremely attractive to hummingbirds and therefore highly recommended in your garden, can be potted or planted directly in the ground. Salvia (Sage) - The best salvias for attracting hummingbirds are Black and Blue (Salvia guaranitica), Rosebud Sage (S. involucrata), Blue Sage (Salvia azure), Hot Lips (Salvia microphylla), Van Houttei Louies Orange Delight (Salvia splendens), and Scarlet sage (Salvia coccinea). This is just a short list, there are many more Salvias and almost all are good nectar sources for hummingbirds. ***The best native perennials for use in our area. (Parts of this list were borrowed from Diane).